Women in Cambodia, seize this brand new opportunity with BRED Bank Cambodia’s latest banking project, Women Initiative! 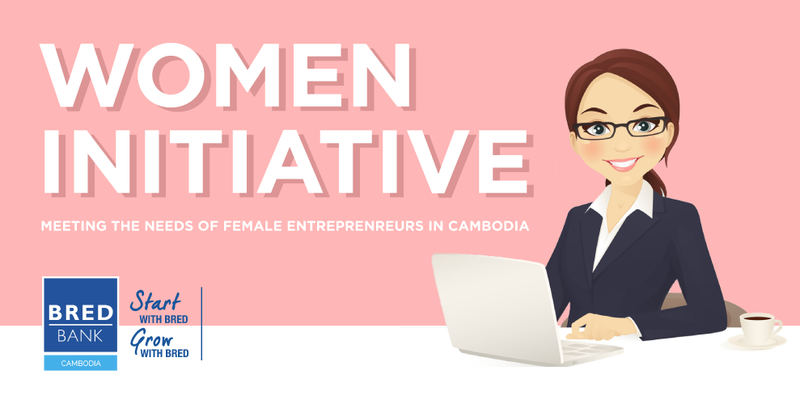 In partnership with the French Embassy and the Ministry of Women’s Affairs, the Women Initiative programme aims to support women entrepreneurs in Cambodia. Right after the New Year, there will be a series of six breakfast talks featuring technical experts and inspirational speakers. Participants can expect to hear their experiences and valuable advice, along with a chance to network and learn new tips along the way. On top of which, a series of ‘how-to’ posts will be made available on BRED Bank Cambodia’s Grow your business Facebook Page for SMEs. Women can look forward to a brand new academy that offers training modules! Those interested can anticipate intimate sharing sessions in smaller groups, with modules offering a combination of technical skills and soft skills. All while being assured that your needs are being taken care of! Be sure to look out for their pilot in May. Around this time next year, BRED will be organising their first Women Business Award, to commemorate and recognise exceptional women who have stood out in their industries. Applicants can harness their newly gained media exposure to increase the scale of their network, as well as receive peer validation. Financial support is still an imperative while operating a business, and BRED Bank Cambodia has come up with new loan offers to aid female entrepreneurs. A new hassle-free loan offer requires mainly an assessment of business performance with limited collateral requirements. Customer depositors can also gain access to an emergency loan in the event of unforeseen family issues. As BRED Bank Cambodia is sure to keep your needs in high regard, female entrepreneurs may stop their loan repayments for three months during pregnancy. The ceremony on March 29 also saw the appearance of distinguished dignitaries, including Her Excellency Eva Nguyen Binh, the Ambassador of the French Embassy, Her Excellency Dr Ing Kantha Phavi, the Minister of Women’s Affairs and the Chairwoman of Cambodian National Council for Women, His Excellency Mr Pan Sorasak, Minister of Commerce, as well as representatives of the National Bank of Cambodia, national and international guests from embassies, organisations and institutions, and other leading companies in Cambodia. Geeks in Cambodia is a proud supporter of women businesses in the Kingdom, and we are always pleased to share new programmes and initiatives that seek to encourage more women to start businesses here. Follow BRED Bank Cambodia for more information on their Facebook page, or call: 023 999 222.